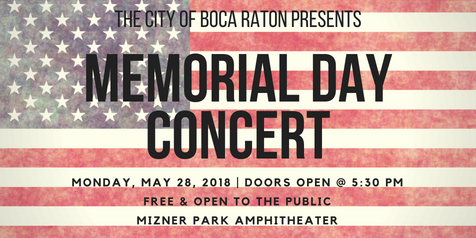 This Memorial Day, Monday, May 28, 2018, the City of Boca Raton will be hosting a FREE Memorial Day Concert event at Mizner Park Amphitheater in Downtown Boca Raton. The concert will feature awesome live musical performances by the Helmsmen, a local Indie rock group, as well as country artists, the Shane Duncan Band. 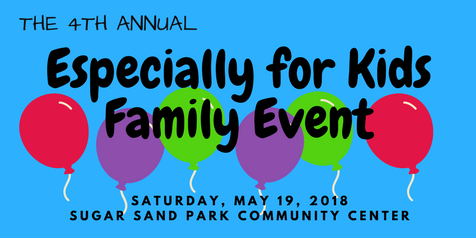 The event will also feature several food trucks, including the local favorite, Tucker Duke’s, serving up a variety of tasty eats & treats, so be sure to bring your appetite. There will also be a beer garden featuring a wide selection of craft beers from Boca Raton Brewery & Barrel of Monks. The City will be teaming up with Forgotten Soldier’s Outreach, a local non-profit organization that supports America’s deployed military service members, to offer an area at the event where items can be donated and attendees can write a letter to a soldier. The donations and letters will be used to create “We Care” packages which will be sent to military service members currently deployed overseas. Donation items such as personal care/hygiene products and non-perishable, individually wrapped snack foods, are greatly appreciated. 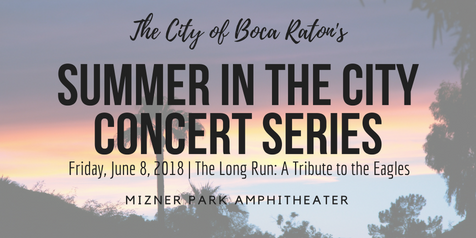 For a complete list of acceptable donation items please visit the City of Boca Raton's Memorial Day special event page.